This is why I love Quebec! 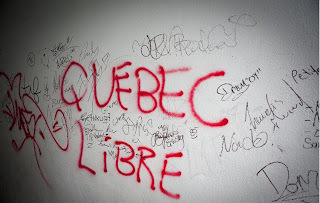 Speaking of nationalism and separation, while Paul and I were in Quebec in September, we heard an interesting interview on CBC radio. It was with the director of a documentary called Questions nationales, which looked at nationalism within countries - specifically Quebec, Scotland and Catalonia.